Introducing iRig PowerBridge, a continuous charging system for iPhone, iPad and iPod touch while connected to digital iRig accessories. Featuring an ultra-low noise audiophile grade power conditioner, comprehensive connection options and other advanced features, it’s the easiest way to plug-in and keep your iOS device charged while practicing or performing with your favorite 30-pin or Lightning compatible digital IK gear. 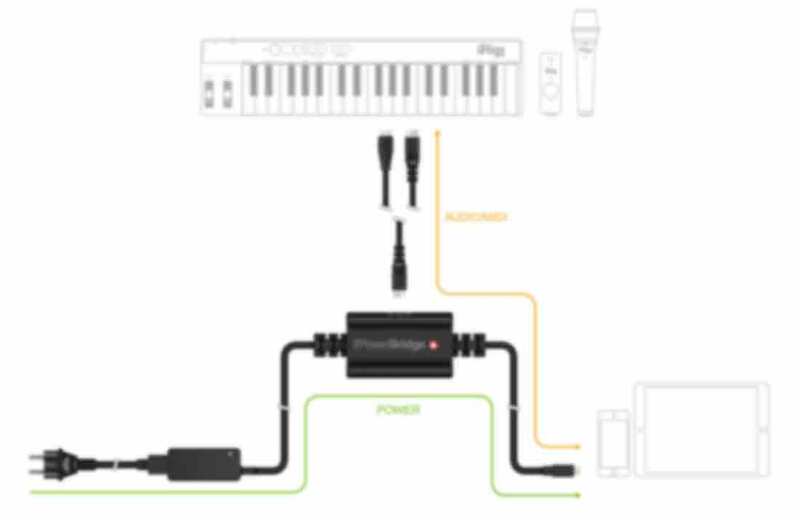 iRig PowerBridge combines a power supply and an ultra-low noise audiophile-grade power conditioner that connects to a power outlet on one end and a Lightning or 30-pin iPhone, iPad or iPod touch on the other. Between both ends is a female Mini-DIN connector that can be used to connect any digital iRig accessories with Lightning or 30-pin connectivity from a Micro-USB or Mini-DIN port. Through this connection, iRig PowerBridge allows continuous charging while also passing along audio and MIDI information between the digital iRig accessory and the iPhone, iPad or iPod touch. Through this streamlined setup, now you can keep your iPhone, iPad or iPod touch charged and play with your favorite digital iRig accessories and powerful IK apps for as long as you want, no matter whether you’re performing on stage, recording in the studio or just jamming at home. It’s the perfect complement to powerful digital iRig accessories with Lightning or 30-pin connectivity from a Micro-USB or Mini-DIN port. 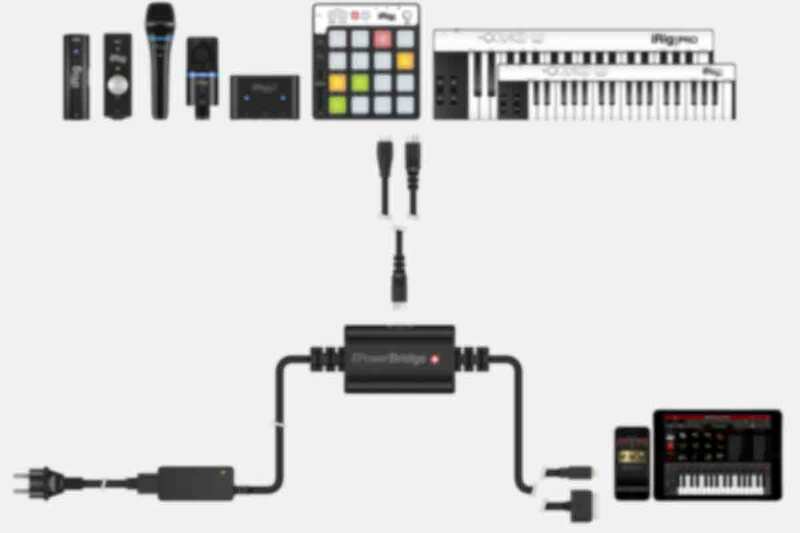 iRig PowerBridge has been designed with portability in mind. It sports a lightweight and compact enclosure that you can easily carry with you in your gig bag of choice. Available as either a 30-pin or Lightning version, it connects quickly for use and features a LED that provides at-a-glance visual feedback while charging. iRig PowerBridge allows continuous use and charging of an iPhone, iPad or iPod touch while connected to one of the following digital iRig accessory. * The iRig Pro Duo can be used with PowerBridge to power your iOS device, HOWEVER please note that iRig Pro Duo is not powered by the PowerBridge unit. iRig Pro Duo requires battery power or an external power supply to operate properly with PowerBridge while connected to an iPhone, iPad or iPod touch. For more information, please visit the iRig Pro Duo page here. 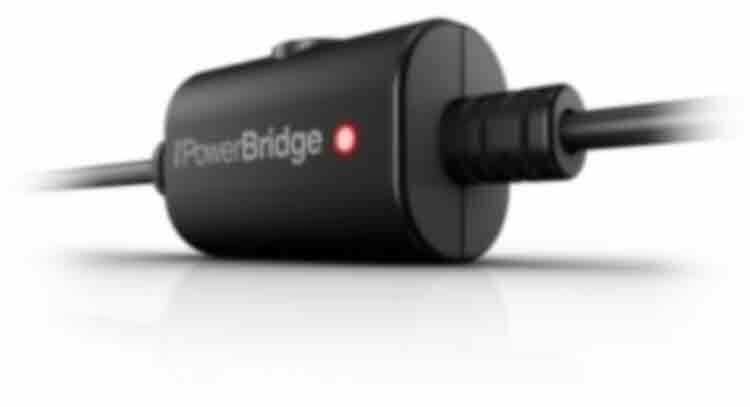 iRig® PowerBridge is a registered trademark property of IK Multimedia Production Srl. All other product names and images, trademarks and artists names are the property of their respective owners, which are in no way associated or affiliated with IK Multimedia. Product names are used solely for the purpose of identifying the specific products that were studied during IK Multimedia’s sound model development and for describing certain types of tones produced with IK Multimedia’s digital modeling technology. Use of these names does not imply any cooperation or endorsement. iPhone®, iPod touch®, iPad®, Mac and the Mac logo are trademarks of Apple Computer, Inc., registered in the U.S. and other countries. App Store is a service mark of Apple Inc.